I'm working through my UFOs and have another finish to celebrate! This has been a top that I've had around for a while - well, sometime this year I think. 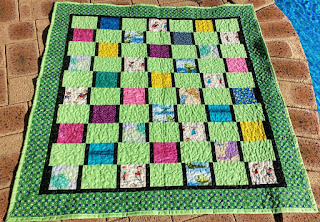 Its a child's quilt with some scraps that I had left over from a previous quilt. I realised it's been a while since I did just a simple stipple over a quilt and I really enjoyed doing this one. It also helped that I managed to do it all in one day - can't remember when I last did that either. 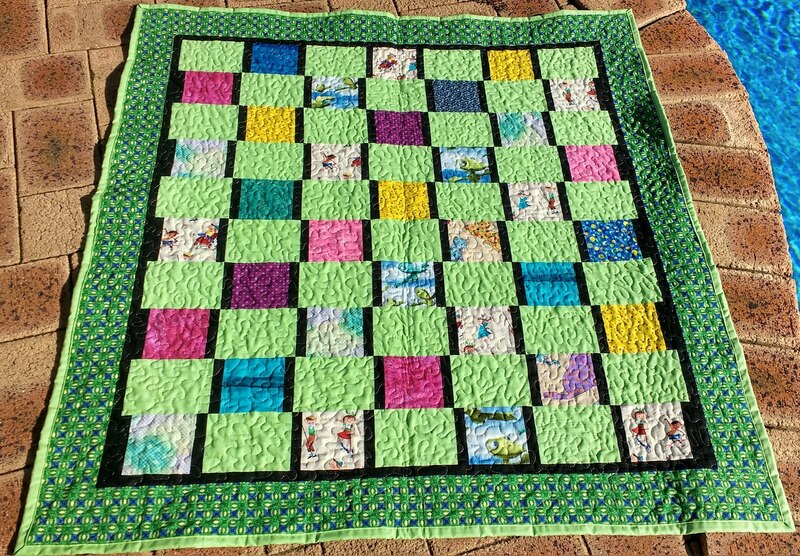 Its a small quilt, but no matter, a finish is a finish! 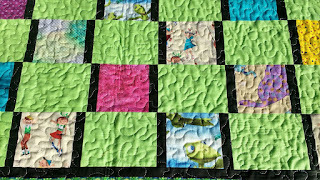 I like the backing too with its soft green like a fossil fern and some left over blocks. 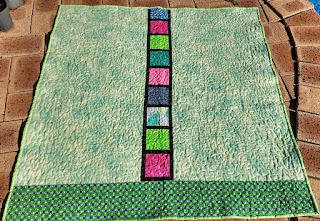 Its so great to use up all the fabric, as I've done here putting a strip of the border on the back as well. My count now is half a dozen, though there could be one or two I've tucked away somewhere and forgotten about. Anyway, on to the next one, another stipple I think I enjoyed this one so much. With any luck I may have chance before the week's out. Thread: Top variegated embroidery cotton; bobbin, Rasant. Congratulations on the finish. 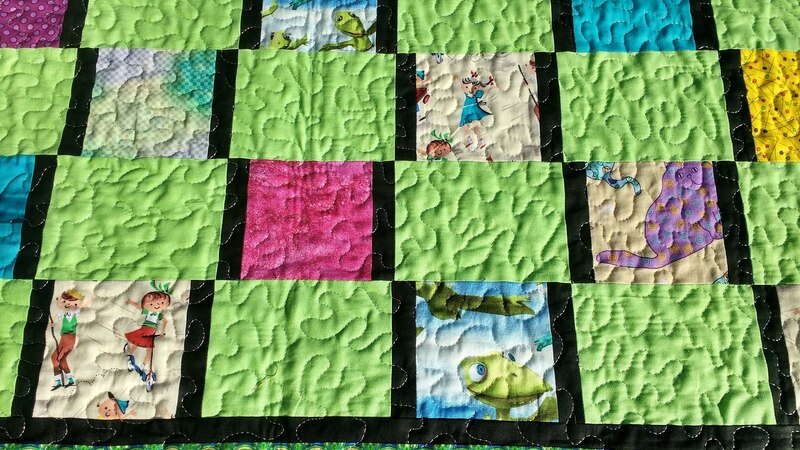 It is a bright, cheerful quilt and I love the backing. I am sure it will bring great joy to the recipient. Gotta love a good stipple! Fast and fun, and it gives such a nice texture. I'll be using it myself this week to finish up a couple small quilts. This one you've made is very bright and fun. 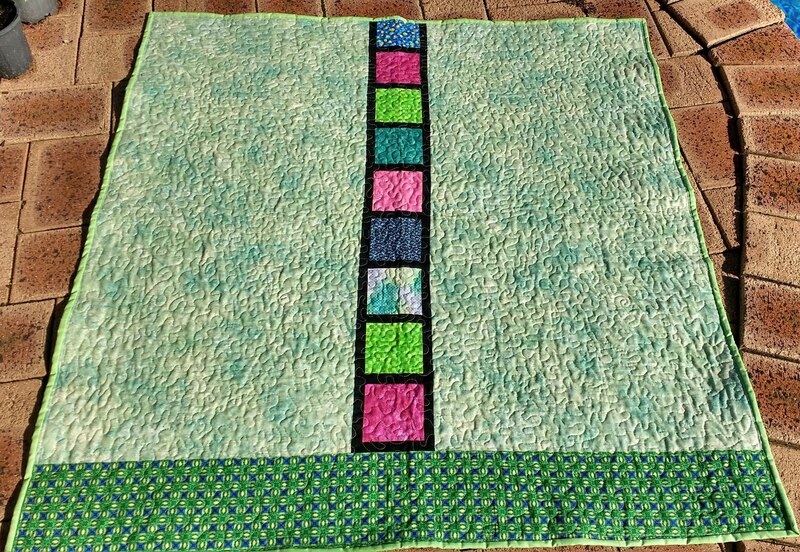 I like how the black vertical sashing makes the vibrant colors pop even more. Great use of leftovers!